Select the best definition for the bolded word in the text. Much of the food eaten by Muslims was that of the desert nomads. Food had to be simple and portable. There was no refrigeration. Muslims would stop at oases as well as in farming areas to get fruits, vegetables, spices and flour for making bread. As Islam spread, Muslims were able to trade and exchange foods. 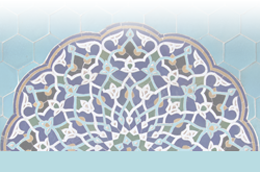 Muslims began settling in villages, towns, and larger cities. Islam began in the Middle East. Because many Muslims were desert nomads, food had to be simple and portable, and there was no refrigeration. Sometimes they would stop at oases to get fruits, vegetables, spices and flour. As Islam spread, Muslims started to trade and exchange food. They started settling in villages, towns and larger cities. There are some rules about food preparation in Muslim culture. 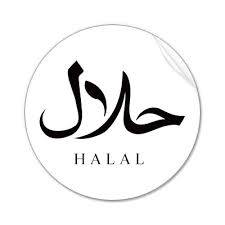 Meat has to be prepared a certain way, so that a halal symbol can be placed on the package. If you have yogurt at home, look at the label – can you find gelatin listed? Muslims are not allowed to eat pork. Gelatin is often made from pork, and is in many foods. 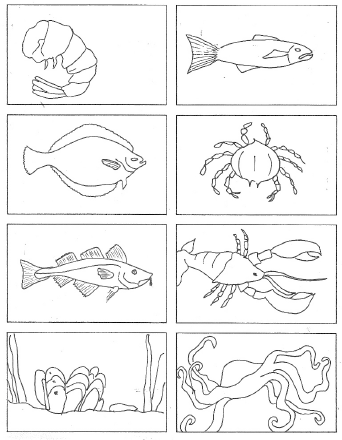 Colour the seafood eaten by Muslims. Are there any foods your family does not eat? Do you know why your family does not eat these foods? Muslims do not eat animals that are carnivorous. Carnivores are animals that eat _________________________. Herbivores are animals that eat _________________________. Omnivores are animals that eat _________________________. Fill in the chart by putting a checkmark (√) showing which group the animals belong. Muslims do eat all seafood.